In mid-2013, the FHA implemented a major change to its loan program that requires the annual mortgage insurance to be paid for the life of the loan if the loan-to-value ratio (LTV) exceeds 90%. This is a very significant change, seeing that many borrowers turn to the FHA because they don’t have access to a large down payment. Prior to this underwriting change, borrowers generally only had to pay monthly mortgage insurance until the loan amortized to 78% LTV. And in some cases, the annual mortgage insurance premium wasn’t required at all, just the upfront mortgage insurance premium. I touched upon this earlier, but the changes are now live. You can see the charts here, which detail the mortgage insurance premiums based on loan term and LTV. To add insult to injury, the annual insurance premium on FHA loans was also increased back in April. So essentially today’s FHA borrowers are actually being hit twice. Note: Those who qualify for an FHA streamline refinance (for loans originated prior to June 1, 2009) only have to pay a 0.55% annual MIP thanks to an Obama administration initiative. If you’re wondering why the FHA made these changes, it was to shore up capital and protect the agency from mounting defaults, and perhaps to level the playing field and draw in private capital. Before this policy change, the FHA was insuring loans out of its own pocket, even if the borrower was no longer paying mortgage insurance premiums. In a nutshell, this basically means FHA loans are a lot less attractive than they used to be compared to conventional mortgages. Before this change went into effect, FHA loans were a hot commodity because they had relatively easy underwriting guidelines coupled with low mortgage rates. Now, even if the mortgage rate on an FHA loan is significantly lower than that of a conventional loan, the mortgage insurance premiums alone can trump the interest rate savings. For example, check out the promotional chart from United Guaranty above, one of the largest private mortgage insurers (that competes head-to-head with the FHA). 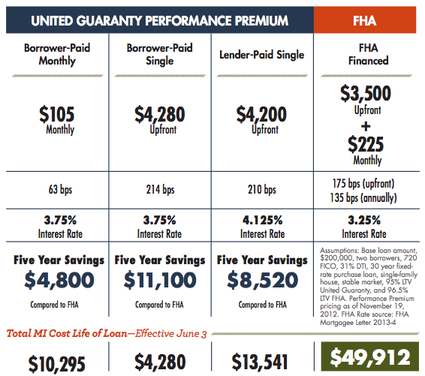 FHA Loans Will Cost $40,000 More? Their scenario, which is a 30-year fixed, $200,000 loan amount at 96.5% LTV for the FHA loan, and 95% for their loan, equates to an FHA loan that is about $40,000 more expensive. The conventional mortgage only requires payment of private mortgage insurance (PMI) for roughly 10 years, while the FHA loan requires it for the full 30 years. And if you notice the mortgage rates involved, the FHA loan is priced at 3.25%, while the conventional loan with PMI is priced at 3.75%. The FHA loan results in less interest paid throughout the life of the loan, but costs the borrower big time in the mortgage insurance department. Now, United Guaranty might have put together a favorable scenario, but even so, the graph illustrates the importance of looking at the big picture. You can’t just shop for mortgage rates by interest rate alone – one-time fees and other costs can change the picture completely. The graph also strengthens the argument of coming in with at least 20% down when purchasing a home or refinancing. If you are able to come up with such a down payment, you can avoid mortgage insurance on the conventional loan entirely, grab a lower mortgage rate, and enjoy a lower monthly mortgage payment. At the same time, the mortgage insurance costs in this graph may be blown out of proportion. Most borrowers only hold their mortgages for six years or so, meaning the full cost of the mortgage insurance isn’t actually realized in most cases. Still, be sure to compare and contrast the costs of all types of loans to ensure you get the best deal for your particular situation. Read more: The differences between FHA and conventional mortgages. Well that certainly makes them unattractive. Who would go for that? Seems unfair if the loan is below 80% LTV and still subject to costly insurance premiums. This effectively makes FHA loans appropriate for those who lack a down payment, which was the original intention. So in that sense it’s a good thing…rich borrowers no longer get to exploit the FHA. It’s the price you pay for putting barely anything down on a home purchase. Bring more money to the table and you won’t have to deal with lifelong MI.